If an iPhone doesn’t recognize the SIM card, it will stop connecting to networks, which will prevent you from using wireless data and making or receiving calls. It’s possible that your SIM card, may just have been slightly dislodged. If that is the case, all you need to do is to reseat it. To locate the SIM Card, find the slot with a tiny hole in it. This is the tray that holds the SIM card. This slot is located in different places on different models. On the iPhone 4, 5, 5C, and 5S, the SIM tray is on the right side of the phone. These models use a microSIM, a slightly smaller, modern version of the SIM card. Also, SIM cards from older phones won’t work in newer models without modifications. To re-seat the SIM card in its slot, use an unfolded paper clip, or a SIM card removal tool. Gently push one end of the paperclip into the hole of the tray. This will pop the tray out of its slot. Check the SIM card to make sure it is firmly seated and push the SIM tray back into the slot. Then wait up to two minutes. The warning should disappear and the bars and carrier name should re-appear on the screen. If this didn’t work, eject the SIM card again and take it out. Make sure the card and the slot it sits in aren’t dirty. If they are dirty, clean them. Blowing into these elements might be enough, but a shot of compressed air is better. Then reinsert the SIM. If this doesn’t fix the issue, your smartphone could be malfunctioning. A good way to test this is by inserting a known, working SIM card into your cell phone. Make sure to use the correct size of course. If the new SIM card doesn’t display the “No SIM” warning screen, and signal bars reappear instead, it means that your iPhone SIM card is broken. 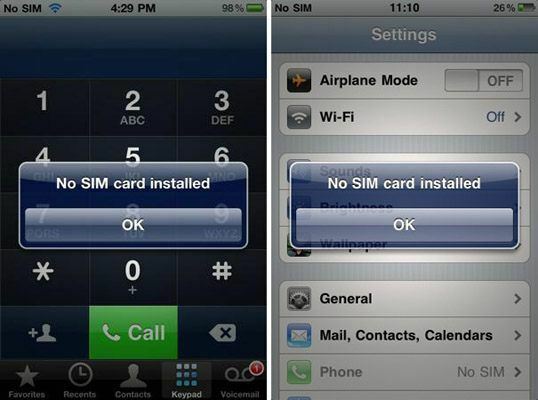 It’s possible that the SIM card in your iPhone isn’t valid. SIM cards can be tied to particular phone carriers and customer accounts. They can be deactivated or not work at all in some countries. If these steps don’t solve the problem with your SIM card, it’s very likely that you’ve got a problem that you can’t fix. It’s time to call tech support or plan a trip to your closest Apple Store or your phone company store. iGotOffer.com: the best place to sell my old iPhone online. Top cash guaranteed. Free quote and free shipping. BBB A+ rated business. If you iPhone can’t recognize the SIM card, just change the iPhone, sorry, but it’s the best way as it’s a clear a sign of malfunctionning.